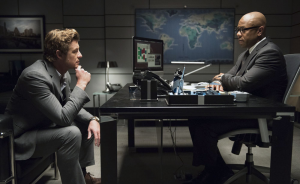 Read on for our recap of the new The Mentalist episode, “Copper Bullet”. Abbott’s former boss Bill Peterson is back, and with all the intentions of framing him for the murder of a cartel’s commander (who had killed many innocent people), thus ruining Abbott’s wife Lena career. But Peterson doesn’t know that Dennis has a powerful “weapon” by his side: Patrick Jane. Jane and the team devise a plan to frame Peterson, who’s been stealing money from the drug dealers for over twenty years, during the DEA raids. Abbott is finally safe and so is Lena, Peterson no longer a threat. This episode was all about three major subjects, in my opinion: Jane’s motivations for helping Abbott, the teamwork, and Jane and Lisbon. Why did Jane help Abbott? The romantic side of me tells me that he did it because the two men have finally learned to trust one another. Lena says that Abbott thinks Jane is a friend, and he would trust him with his life. This is a huge step forward, if we only think of how the two started… Dennis put his life, his career, and Lena’s career too in Jane’s hands, and Jane didn’t fail. The not so romantic side of me tells me that Jane might have an ulterior motive: Abbott could decide to free him from his five years contract with the FBI, and never to mention the list of names of the Blake Association Jane should have (but doesn’t really have). Whatever the reason(s), this episode was pivotal in stressing how much Abbott is not just a boss anymore, he’s part of the family. This episode made me remember when Lisbon was the boss, back at the CBI, and in the episode 2×03 “Red Badge”, her team put their careers at risk to help her, when she was framed for a murder she didn’t commit. They didn’t stop until the real killer was caught. I recall also the way the CBI team has protected Hightower and her kids. When Abbott announces that he’ll be moving in D.C. soon, with his wife, we find out that Cho will replace him, and he will be in charge of the unit. Will Cho be Lisbon’s boss? Remember the episode 3×17 “Bloodstream”? LaRoche demotes Lisbon and puts Cho in charge of the team… Just for one episode, but now it looks like Cho will indeed have his own team. In this episode we also meet two old friends of Jane: Pete and Samantha, who help him frame Peterson. Both Pete and Samantha are very happy to know that Jane is finally trying to move on with someone else. Pete suggests Jane that it would be time to take his wedding ring off, that his wife Angela would want to see him moving on. Samantha tells Jane that life is too short and to not ruin what he’s building with Lisbon. Will the wise words from two old friends be finally assimilated? Neither Peterson nor Abbott were being framed. Abbott really did murder that drug lord– Peterson was blackmailing him for something he really did do. Peterson really was skimming money off the top– the team didn’t frame him, they used an elaborate con to record him admitting to it. Ultimately, the story hinged on Peterson’s motivations. Peterson repeatedly reminded Abbott that he was guilty of murder and so turning him in would be right. But when the cost of bringing Abbott to justice became revealing his own crimes, Peterson backed off. Jane’s plan hinged on Peterson’s dishonesty. Given Lisbon/Jane/Cho’s past, it’s no surprise that they weren’t outraged by what Abbott did.